The Avenue of the Giants runs parallel to U.S. Highway 101 between Exit 672 near Pepperwood and Exit 645. Driving on 101 between those exits takes about 25 minutes. If you go on the Avenue of the Giants instead, it will take at least 2.5 hours with time for a picnic stop and a walk in the woods, or it can take all day if you stop frequently for photos. We've listed a few of the best stops along the way here. The reason to consider this extended drive is the trees. 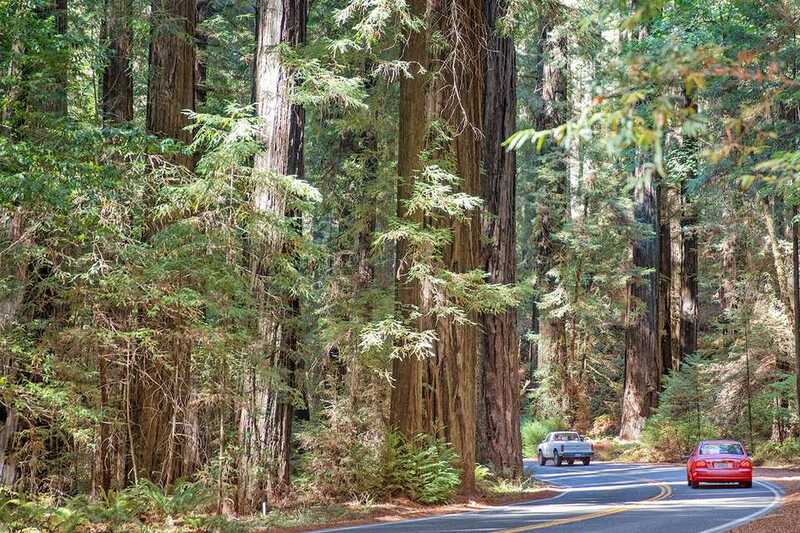 You'll find few places anywhere in the world where you can drive on a paved road between soaring coastal redwood trees that can grow as tall as a 30-story building and make the park smell like Christmas all the time. While this is very much the trip of a lifetime for many people, others come away disappointed because their expectations were different than what these trees and this drive really are. For example, don't expect the entire 30-plus miles of the drive to be wall-to-wall redwood trees—that's not how the coastal redwoods grow. Instead, they occur in groves separated by other kinds of trees and plants and even small towns. This is also not a location where you can drive through the middle of a redwood tree on the highway. You can find a few of those remnants of the early twentieth century when cutting holes in trees in the name of tourism outweighed the risk to the trees themselves, but they are all on private property. The Shrine Drive-Thru Tree is easy to find near Myers Flat. And don't confuse sequoias with redwoods. The coastal redwood is the world's tallest tree—about 70 feet taller than a giant sequoia—but they have a slender trunk, relatively speaking. If you're looking for the world's most massive trees by volume, the ones with trunks more than 30 feet across and limbs the size of oak trees, they grow in the Sierra Nevada Mountains in and around Sequoia and Yosemite National Parks. Getting onto the Avenue of the Giants is easy. Just take Exit 672 or Exit 645 from U.S. Highway 101, depending on which direction you are traveling. Ignore all the signs after that point toward 101 or you'll miss part of the Avenue. When you get to the end, U.S. Highway 101 will be your only option. Exit 645 is marked as Avenue of the Giants Alternate Route, but don't let the word "alternate" confuse you. What they're trying to say is that the Avenue is an alternative to staying on Hwy 101. In places, the road is wide enough for two cars to pass between trees so close together you could almost reach out the window and touch them, but it's still suitable for big RVs and vehicles towing trailers. Most of the stops you'll make along the Avenue of the Giants will be to see the tall trees, but Grieg-French-Bell Grove is a place where you should look down as much as up. Lush, green sorrel plants carpet the entire forest floor. They grow so thick that they even cover fallen trees and logs. The turnout for the grove is near the north end of the Avenue. It's on the west side of the road. The sign is difficult to spot, and parking is along the side of the highway. If you want more details about hiking in the grove, use this description from Hikespeak. The South Fork of the Eel River flowing alongside the avenue is almost as attention-getting as the trees. The road parallels it for most of its length. On a hot day, the river looks so inviting you may be tempted to stop and jump in. Salmon and steelhead trout thrive in the river, but despite its name, no eels live in it. Instead, it's home to the eel-like Pacific lamprey, a jawless fish that grows up to 30 inches long and spawns in the river during the spring. The easiest short hike to take while you're enjoying the Avenue of the Giants is the one at Founder's Grove. The 0.6-mile-long trail is easily accessible and flat. In one short stroll, you can gaze upward at the tall trees, see the massive root systems of fallen giants, and check out a couple of living trees with burned out centers that leave you wondering how they survive. Until 1991, the tallest tree in the world was in Founder's Grove. The 362-foot-tall Dyerville Giant was 60 feet taller than the Statue of Liberty and about 1,600 years old when it toppled under gale force winds during a rainstorm. Today, you can still see it on a half-mile walk from the Founders Grove, doing its part in the ecosystem by decomposing on the forest floor and feeding new life in the forest. You'll see some brown Auto Tour signs along the road. In theory, they lead to interesting sights, but in fact, many of them are more mundane than amazing. Instead of stopping at every one of them, take advantage of this guide, which will take you to the places which are guaranteed to impress. Cell phone service is non-existent along much of the Avenue, so download a map before you go (best available online map is from the Humboldt Redwoods State Park) or get a printed one. Humboldt Redwoods hosts two marathon runs each year. They happen in early May and early October and can close the Avenue of the Giants for up to six hours. For dates and details, check the Avenue of the Giants Marathon website or see the Humboldt Redwoods Marathon site. It's a California state law: If you are traveling at a speed slower than the rest of traffic on a roadway, and a line of five or more cars forms behind you, you must pull over to let them pass as soon as it is safe to do so. Traveling between sunlight and shadow, the change in brightness can temporarily blind you. Dust on the outside of the windshield and hazy film on the inside make it worse. To minimize the effect, your windshield should be spotless inside and out. The Avenue of the Giants is in Humboldt Redwoods State Park. The park visitor center is at Weott. Both of them are part of the scenic drive called the redwood highway.